Nnedi Okorafor is an award-winning novelist of African-based science fiction, fantasy, and magical realism. Born in the US to Nigerian immigrant parents, Okorafor is known for weaving African cultures into creative settings and memorable characters. Her book, Who Fears Death has been optioned by HBO, with Game of Thrones' George R.R. Martin as executive producer. Okorafor is a full-time professor at the University at Buffalo, New York (SUNY). "Chaotic, enthralling, and moving fluidly from character voices to oral-style narration to gut-punchingly beautiful prose"
"Lagoon is a wonderfully contemporary look at how people react when confronted with the unknown on a massive scale, with all the personal character changes and challenges I could hope for. I loved reading Lagoon and it is definitely going on my reread circuit." 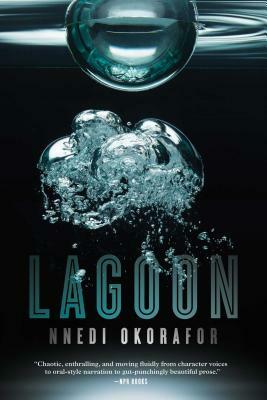 "Lagoon mixes a traditional trope of SF – first contact with visitors from the stars – with African magical realism to create a lyrical, poetic mash-up examining social deprivation, religious excess and the power of story on our lives." "Lagoon is a fascinating entry into the science fiction of place."